Davidoff The Game Intense invented to attract the attention of the ladies. Davidoff The Game Intense 100ml. Eau De Toilette - Concentration, composure and confidence in his decision to transform man from an ordinary man in the street to the winner and the game master. These qualities are inherent in each, but few know how to activate them in yourself and send in the right direction. Exceptional inspiration from Davidoff The Game Intense fragrance will help you cope with them and to uncover the best quality. The elegant, inspiring East-woody bouquet from the first minute gives a feeling of confidence. Bright aroma of gin slowly flows into the chord black rosewood and iris, and on the other hand they are greeted by the excellent duo of patchouli and labdanum. The smell is beautiful, noble and elegant. It is heard courage and intelligence, confidence and success. Surround yourself with the fragrance of night success, completing the image of the present, the modern man. Swiss eau de toilette Davidoff The Game Intense will become your secret weapon of success in both business and romance. The creator of the fragrance is young, but already very famous perfumer Lucas Sieuzac was inspired by gambling on poker, because of its noble and intellectual character so impressed by the bold, risky men. Men's fragrance Davidoff the Game Intense - this fragrance winner, a great option for the brave and resolute men. This perfume is dedicated to all the brave men who love risk and are ready to give emotions fully. Stylish and mysterious, this manly scent will be the pearl of the collection and will long remain in the display. 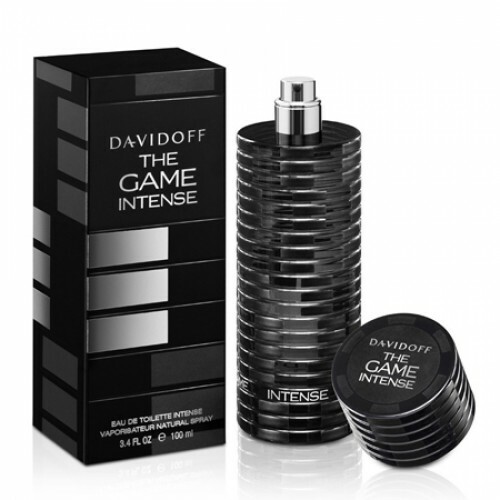 Perfume Davidoff Game Intense offers a gin and tonic chord, juniper berries, gourmet note of iris root and ebony. But for a more pronounced manifestations of male identity designers added a deep note of black patchouli and sensual Cistus absolutes.